In 1970, science fiction was real. We had just landed on the moon, the first Oil Crisis hadn’t hit yet, and it seemed like, just maybe, anything was possible. That’s the world in which the Lancia Stratos HF Zero debuted, the lowest, widest, wildest future-wedge of all. It looked unreal at the time. It looks wilder now. 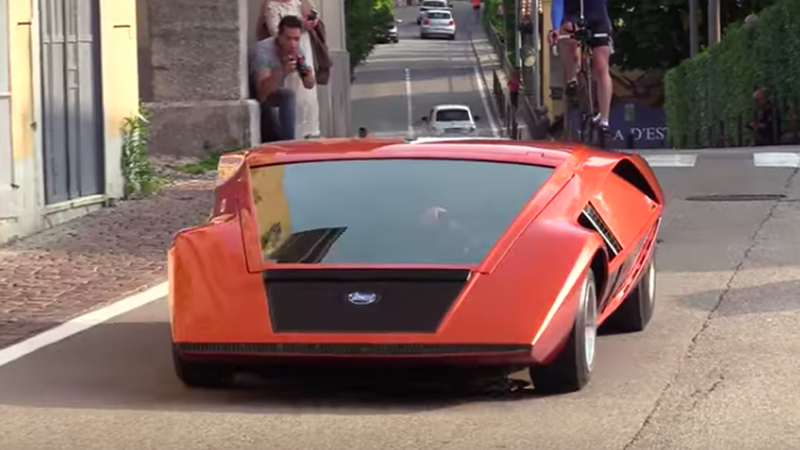 The Stratos Zero is usually seen at prestigious car shows and concours, as it was at the Concorso d’Eleganza of Villa D’Este over the weekend. While I appreciate that this design can be seen in safe confines like that, I appreciate it much more when it gets to run its Lancia V4 on the road, looking like an alternate history where half of the human population lives on space stations and terraforming barons are busily turning other planets into lush jungles. Again, just take in how spectacular this Marcello Gandini design looks on the road. Photographers line the streets for it, to the point that a woman has to step over one of them. This is what we need more of. Also Michael Jackson Made A Replica For "Moonwalker"